The branches of the armed forces serve and protect civilians but what happens when cyber attackers get them? In the world of online security, ammunition and tactical field work can’t stop a cybercrook from doing damage. As we have seen, the military and armed forces are not immune to the destruction that can be imposed by hackers and other internet criminals. Just last week, as we reported, there was a massive data breach affecting tens of thousands of military personnel emails and encrypted passwords. 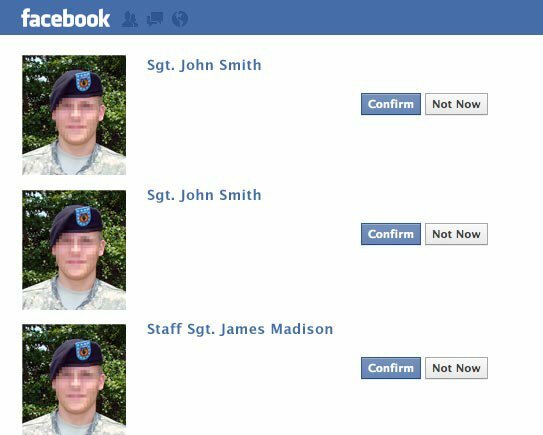 So, with a multitude of looming privacy and security issues running amuck, we examine the past and present of the military’s personal usage social media. Then we ask you to think about the future. In a recent statement on the Official United States Army Website, the message remains the same: military members must use social media cautiously to protect their online privacy and the security of fellow personnel. The release from the Social Media Division of the US Army Office of the Chief of Public Affairs states that Facebook and other networks are crawling with fake profiles and scammers posing as military personnel when they are actually cybercriminals! And these scam artists (pictured at left courtesy of the US Army) work tirelessly to steal personal information as they impersonate Soldiers in attempts to acquire sensitive information. Do not share information that you don’t want to become public. Verify a “friend” request by phone or other means before allowing access. Group “friends” into different categories and control access permissions based on the groups. Users should be careful about what they post about their lives on social media platforms. Once something is out there, users can’t control where it goes. Be cautious when listing job, military organization, education and contact information. Ensure that information posted online has no significant value to the enemy. Always assume that the enemy is reading every post made to a social media platform. Closely review photos before they go online. Make sure they do not give away sensitive information which could be dangerous if released. Make sure to talk to family about operations security and what can and cannot be posted. Create different, strong passwords for each online account. Never give password information away. As the military presents these guidelines today, we ask you to think about the future of social media and the armed forces. Should these men and women be banned from using these social networks? Are their benefits to having the military on social media? What are the negatives?